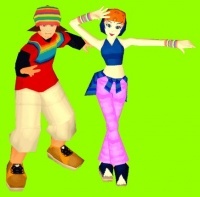 IZAM and NI-NA as they appear in DanceDanceRevolution 4thMIX. A former American transfer student. His special skill is talking in English (in an Utah accent). He doesn't get along with Reiji in public. Part of the SPECIAL SELECTION duo in DanceDanceRevolution 4thMIX, along with NI-NA. IZAM was created by designer Akira "UZI" Iizumi. This page was last edited on 8 January 2016, at 19:03.